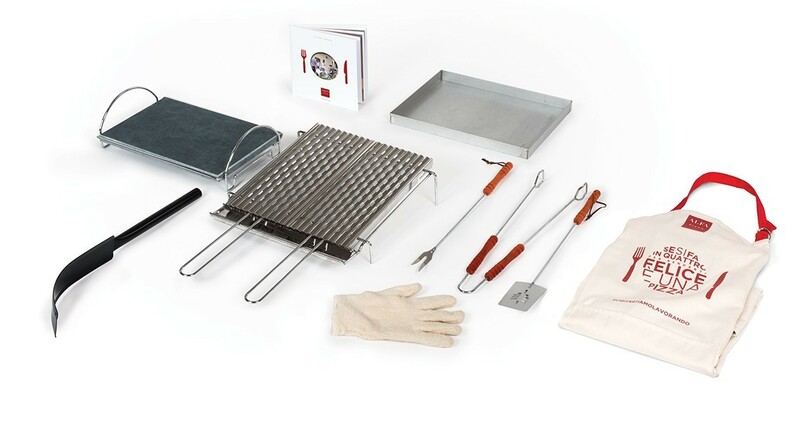 In the Kit Rosticcere you have all the tools you may need to turn the wood fired oven in a barbecue. Enjoy organizing grill parties with Alfa Pizza Ovens. 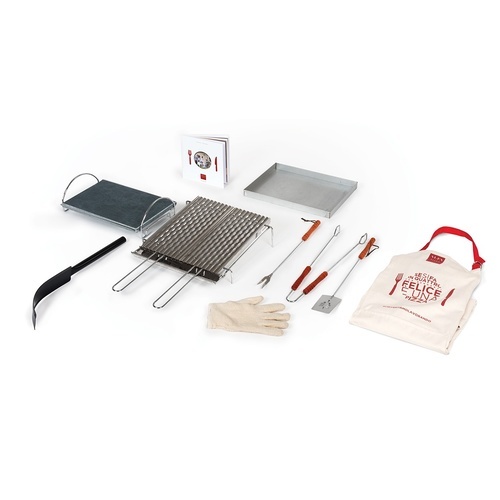 Inside the kit you will find all the tools to grill meat, fish or vegetables. Cutlery set: set of steel cutlery for grilling, with wooden handle. The set consists of tongs, carving fork and spatula. Grid: the grid is made of stainless steel, it is bright and polished with rounded edges. The two parts can be separated so to facilitate the shifting, the preparation, the washing and cleaning. Soap stone: the soap stone, equipped with a chafing dish, withstands very high temperatures and heats evenly over the entire surface. Once you reach the correct temperature, just place it upon the cooking floor to roast meat and fish in a natural way. Tray: with the tray you can bake every kind of food, from meat to vegetables. It ensures a slower cooking for tasty foods. Apron: with the Alfa Pizza apron, any chef will be recognized. Glove: the heat-resistant glove in 100% cotton bouclé continuous filament is ideal to safely use the hot parts of the wood-fired oven. Ember: with the ember tool you can move the ember and push it in the oven corner. Cookbook: in the cookbook there are lots of recipies to cook in your wood fired oven. 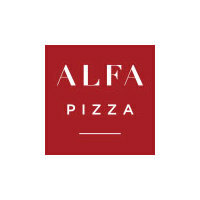 The recipies are made by Alfa Pizza cookers.